It’s set all over the medieval age. There are stuff from every century there! But I am sure there’s a set year or something around. Well, that’s a tough question. We have weapons like the Zweihander, predominantly used in the Renaissance era (16th century) and then we have the Oakeshott type swords, like the broadsword, dating back to a much earlier time. And then we have the Norse (Ulfbehrt) sword, dating to 800-1000 AD. Also, the Agathian knights, wearing plate, look at home in about the 15th century, while the Mason knights look more like 1000AD Saxon warriors. So, it’s pretty hard to tell. Short answer: It’s not really based on any time period. It’s more of an alternate universe. Seriously though: The classes meander about early and high medieval, I’d say. Vanguard basicly look like 13th or late 12th century knights. I think Agatha knights wear a coat of plates (late 13 early 14 century……ish?) with a late houndskull bascinet (15th or even early 16th century). Mason wears a weird coat of plates or some form of brigantine as well. I don’t really know where to put him though. Perhaps also 13th century, with a slavic or russian flavour? Not really sure about that one. I can’t really file the Mason archer either. The mason MaA looks like an early medieval footman due to the tunic and the spangenhelm (9th-centuryish I would think). The Agatha MaA in the other hand looks like a high medieval/gothic footman (14th cent. I would say), with his open bascinet (or is it a sallet variant?) and his boots. The Agatha archer (my favourite character design in the game) is defiently 14th century with a 14th centuy kettle hat and an aketon or gambeson. The weapons are a wild mishmash as well. The Zweihänder for example is a 16th century weapon (Carried by someone looking like a 13th century kight no less. But chivalry aren’t the first to do that. 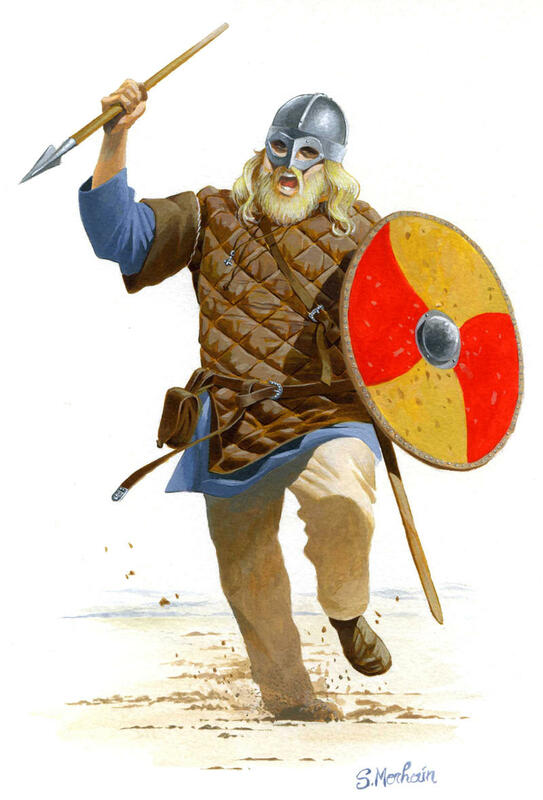 ), while the norse sword is more of a 9th century kinda guy. But since I think nothing really clashes with another (excep perhaps the helmet of the agathian knight) I really like the aesthetics as they are presented. And a great weapon variety is always nice. It’s better to use a 15th/16th century pole axe to fight a 9th century guy using a 14th century axe than to have 10 different flavours of billhook. Not that there’s anything wrong with billhooks. Billhooks are amazing.